The play therapy feeling cookie was a certainly fun and exciting activity. The supplies needed included white frosting, three or more bottles of food coloring, paper plates and plastic forks. The procedure for creating the feeling cookie is a three-step process. First, scoop about a one teaspoon of frosting and place on the paper plate. This process will be repeated three or four times depending on amount of colors selected. I selected four colors for my feeling cookie; those colors included red, yellow, blue, and green. The second step in the play therapy cookie process involved adding the food coloring to the frosting. The bottles of food coloring are small for a reason; the chemical compound used is very potent. Therefore, use one to two drops at a time then use the plastic fork to mix the color into the frosting. More food coloring may be used to get a darker hue of a particular color. If the color gets to dark or if a lighter hue is desired simply add more white frosting. The third and final step of the activity (the must fun part) involves decorating the cookie according the participants’ feelings. 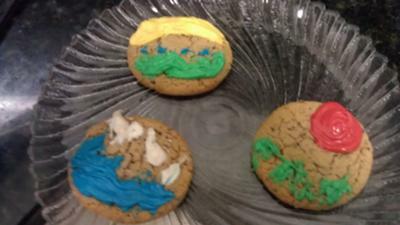 The classroom activity used small vanilla looking sugar cookies. There wasn’t much room to decorate on those small cookies therefore; when I recreated the activity at home I used three oatmeal cookies. In addition to preferring the size of oatmeal cookies I also like the color contrast and the texture of oatmeal cookies. 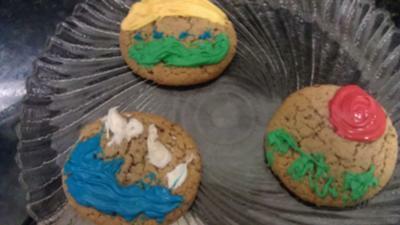 The first play therapy feeling cookie was decorated with a strip of yellow across followed by a row of blue dots across the center and a wave of green. The yellow represented the cheerful mood I was from the morning of the day I created the feeling cookies. The blue dots represent my calm through the day, and the green represents Spring; my favorite month of the year. The second play therapy feeling cookie had a row of white dollops on the top and a wave of blue swirls on the bottom. The white represented tranquility like floating clouds in the sky. Seeing clouds in the sky earlier that day prompted idea for the cookie. The blue is also for tranquility and calm experienced during that day. The third and final play therapy play therapy feeling cookie had a read swirl on the top and a series of wavy lines on the bottom. The red swirl served a dual purpose it represented the sun with its warmth and intensity. It also represents my passion for helping people in my IT job and my future endeavors of helping people in mental health. The green also has a dual purpose; the recognition of nature’s rejuvenation during the spring, and my hope for financial success as a counselor.